Spindle (Euonymus spp. ): growing, planting, caring. Hardy bushes with a lovely bright red foliage in autumn. Scientific name : Euonymus spp. Euonymus is a genus of flowering plants in the staff vine family Celastraceae mostly native to East Asia, and popular garden subjects grown for their foliage, often with bright red autumnal colours. 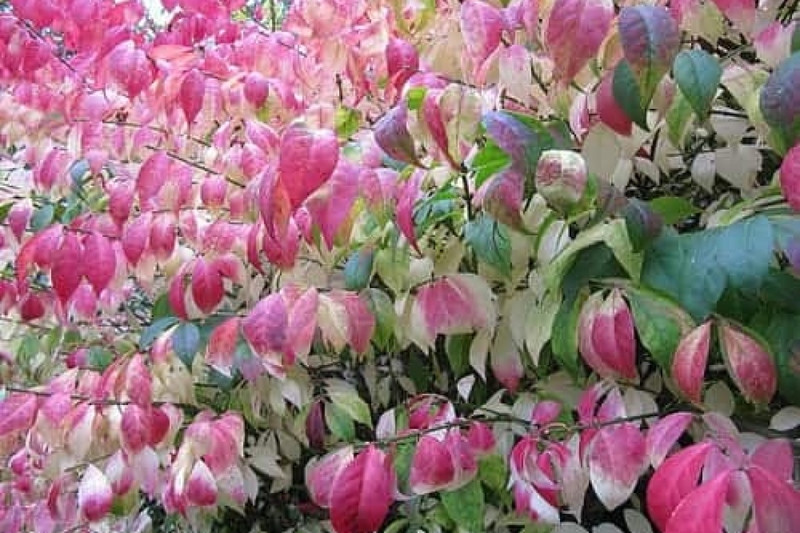 Species of Euonymus are deciduous and evergreen shrubs, small trees and lianas, with opposite - or rarely alternate - and simple ovoid, typically 2–15 cm long leaves with a finely serrated margin, and green, yellow, pink or maroon flowers. Euonymus are deciduous or evergreen shrubs with opposite leaves, rarely alternate, simple, toothed or crenate. They carry in May-June small white, green or red flowers grouped in cymes. Fruits more or less spherical, winged, lobed. Plant your spindle early in the fall or in the spring, avoiding freezing periods at all costs. Choose a spot in the sun or partial shade, in a well-drained and rather cool soil if it is in the sun. Shelter evergreen species from cold, drying winds. In pots, plant them in a mixture of earth and potting soil. Prune the evergreen spindle by removing only the flower stalks. For deciduous species, thin the shrub each winter, also removing dead and intersecting branches. For deciduous spindles, take herbaceous cuttings in June and put them directly in water until the roots appear. You can then transplant them into a light mix of potting soil and sand, and set them up in March.